These counties occur mostly in the southeastern United States, along the Appalachian Mountains and the Gulf Coast, with some scattered counties in Florida, South Carolina, Texas, Oklahoma, Arkansas and Kentucky. These areas are characterized by a higher Wildland Urban Interface (WUI) area and large number of ignitions. Example of a Typical County — Pike County, Kentucky: Pike County lies in easternmost Kentucky. It has many small private woodland parcels and many human ignitions. There is high risk of large wildfires, less potential for resource benefits. These counties have a history of using prescribed fire and could expand or maintain use of this fuel management option. There may be an active forest products industry nearby, which could support fuel treatments. Treatments may be economical as a precursor to prescribed fire. The focus would be on treating the periphery of the area to act as a buffer. Individual homeowners can be proactive on home defensive actions. 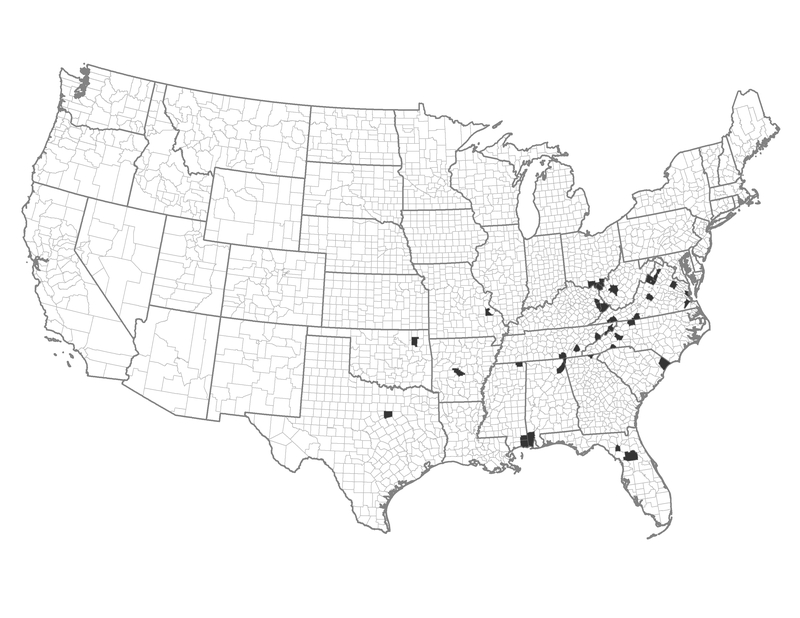 These counties could adjust building and construction codes in municipal areas. Human caused ignitions are a problem in these counties. Reduce accidental and human-caused ignitions through enforcement or outreach. Prepare for large, long duration wildfires. Protect structures and target prevention of ignitions.